Hugh Hill (Laka’tos), from the Oneida Nation, lives in St. Thomas, Ont. 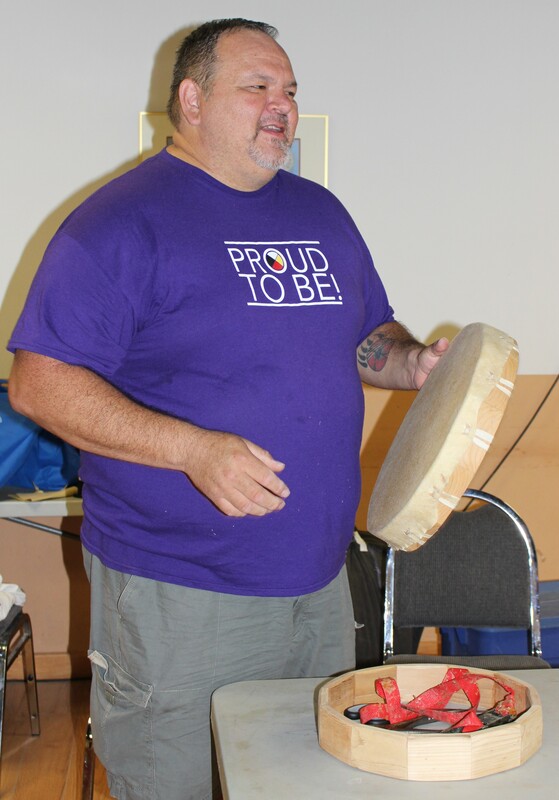 A drum maker for the past 18 years, Hugh has been making and sharing the traditional crafts he has been taught through his elders. Attending and participating in traditional dance at many pow wows and traditional gatherings throughout the year (including MOA’s which takes place the third weekend in September) provides Hugh an expression of his native roots. Hugh has been gifted many teachings. Respectfully talking and listening to elders (among others) in his travels has contributed to the repertoire in his workshops. As with all of the teachings he has learned along the way, these teachings are to be passed along. Through workshops on traditional and social hand drums, traditional and social big drums (pow wow drums), the Medicine wheel and sewn rawhide rattles, these teachings are shared with both large and small groups. Hugh has worked in various locations across Ontario, Michigan, and Quebec, as well as special interest groups touring from Europe and Asia. Hugh continues to learn and teach, believing in passing along what he has been given and told. Join us at our Family Day event on Monday, February 15th, when Hugh will share his teachings in a Medicine Wheel Teaching and Art Workshop. The Medicine Wheel represents all creation, harmony and connections. Come and learn about the teachings and significance of the Medicine Wheel in Aboriginal culture in this interactive and family fun workshop. Each participant will paint their own Medicine Wheel art piece to take home. Join Hugh Hill at his workshop, offered at 11:00am-12:00pm and again at 2:00-3:00pm on February 15th.